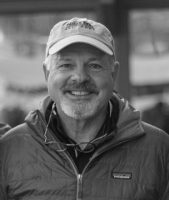 Leadership skills and a true commitment to the sport of skiing in Michigan have earned Harbor Springs resident James “JB” Bartlett a place in the Michigan Ski Hall of Fame. He was inducted on August 20 during a special ski industry dinner at Boyne Highlands in Harbor Springs. The Michigan Ski Hall of Fame was created in 2003 to recognize those individuals who have contributed significantly to the growth of skiing and snowsports in the state of Michigan. Bartlett is the eleventh individual to join this elite group of ski industry professionals. A graduate of Western Michigan University, Bartlett’s entire career has centered on skiing. He started as a professional ski patroller first at Boyne Highlands and then at Big Sky, Montana. Coming back to Michigan in 1977 he took the area manager position at Nub’s Nob in Harbor Springs, where he helped develop and patent the Nub’s Nob fan gun, which has led to faster and more efficient snowmaking. Today many ski areas across the Midwest use some derivative of this technological advancement. Ten years later, Bartlett took over as general manager of Nub’s Nob, a position he held for 30 years. During this time he not only saw the area through numerous expansions but he also made many contributions that have improved the ski experience for all Michigan skiers and snowboarders. He installed hundreds of snow guns on towers and “stalks,” leading the charge on permanent snowmaking installations in the Midwest. This paradigm shift demonstrated how to make snow fast with varying weather. His foresight on snowmaking infrastructure is even more critical today as Michigan ski areas contend with large weather swings.